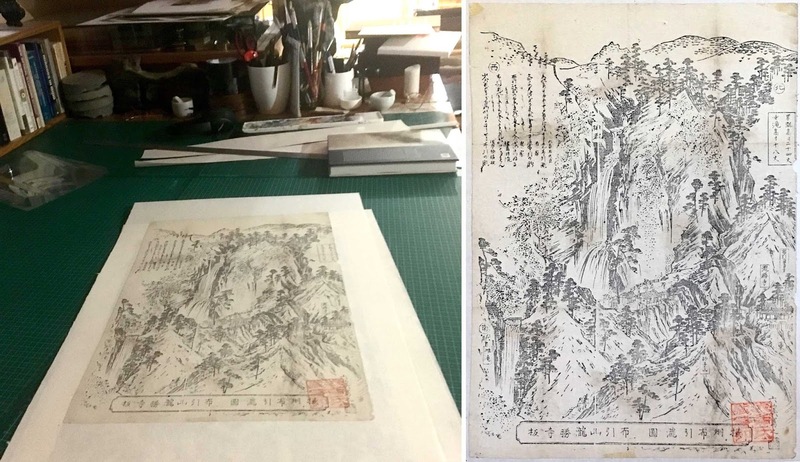 Woodcut print on fine washi paper lined onto a conservator’s support sheet. Stamped with a collection seal (transl. 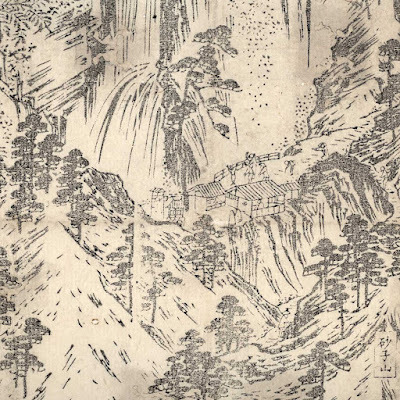 “Big West’s Book Collection”) and inscribed with cardinal orientation notes, temple sites, the height of the waterfall (18 zhang? ), the title of the map (transl. 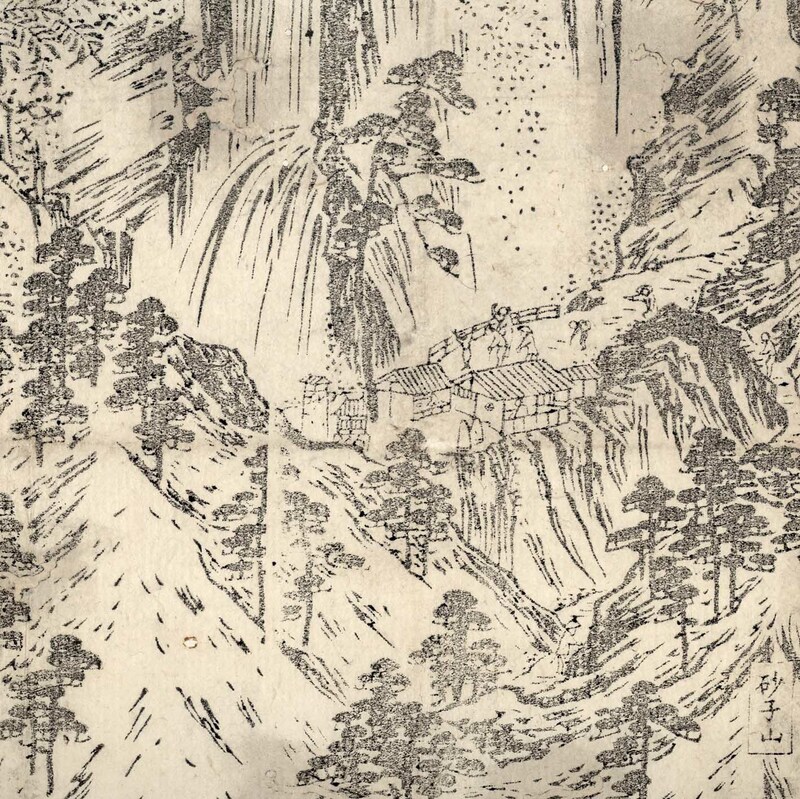 “Ban [broad] Temple, Sheng Long [Winning Dragon] Mountain Distribution [Map]”) and lines of descriptive text. 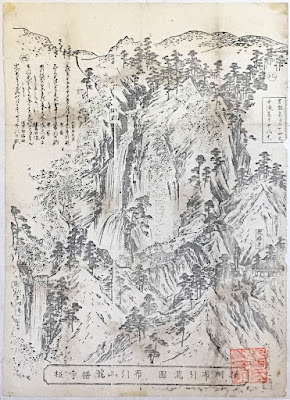 Condition: a large woodblock print on exceptionally fine paper that was once folded and repaired and is now flattened and laid upon a conservator’s support sheet. The early repairs to corners of the folds are still visible and there are repairs to early wormholes. I am selling this early, VERY RARE and large woodblock pilgrim’s map for AU$93 (currently US$70.86/EUR63.51/GBP55.78 at the time of this listing) including postage and handling to anywhere in the world. If you are interested in purchasing this spectacular print, please contact me (oz_jim@printsandprinciples.com) and I will send you a PayPal invoice to make the payment easy. 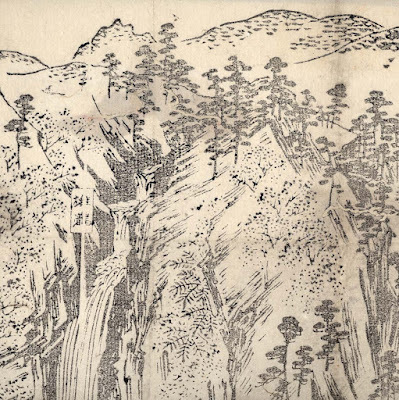 My knowledge about this woodcut map of a mountainous region with waterfalls in Japan is very thin. Nevertheless, rather than offering no thoughts at all about what can be seen—mindful that I have been unable to find any reference to this map—I have decided to attempt the crazy idea of proposing what it shows. 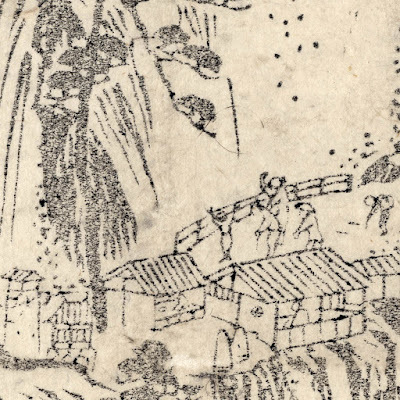 I suspect—and again I need to say clearly that I really don’t know for certain—that this is a temple map designed for pilgrims travelling to the sacred Nunobiki waterfall(s) in Kobe. 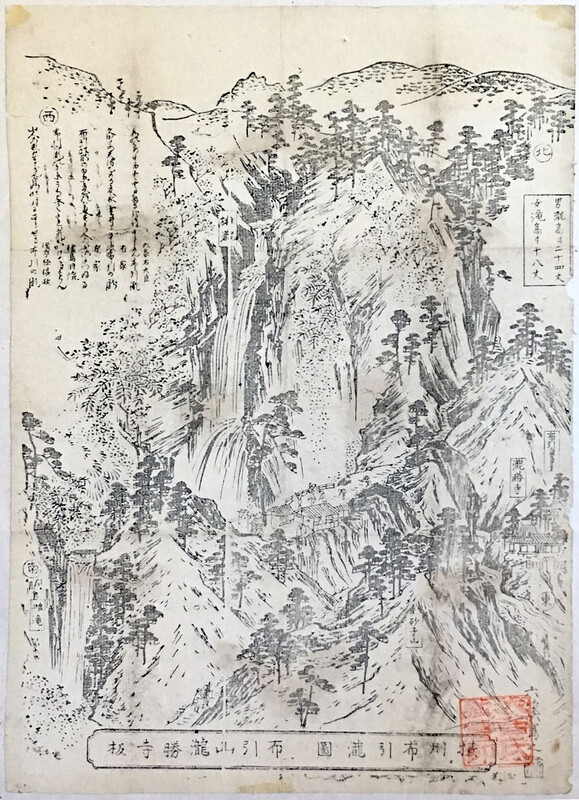 Certainly, the main waterfall portrayed in this print looks like the Nunobiki waterfall (see http://www.world-of-waterfalls.com/asia-nunobiki-waterfall.html) which I understand means “draped white cloth”, but there are other waterfalls that have a similar appearance (e.g. the Nachi waterfalls). 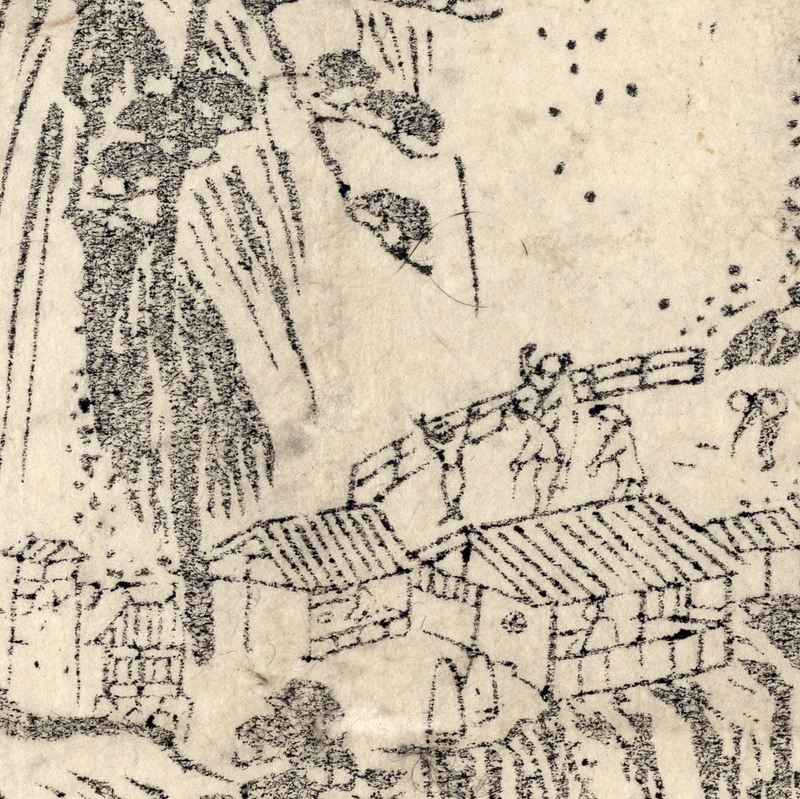 One feature of the map that should be an important key site is the lower cartouche/text-box that my Chinese mate tells me is an inscription about “female turtle”. This reference fits well with my idea that the region encouraged female pilgrims, but I understand that only the Nachi falls has an ancient temple dedicated to the turtle (I hope my term “dedicated” is not too inappropriate) revered for longevity, support and good fortune. 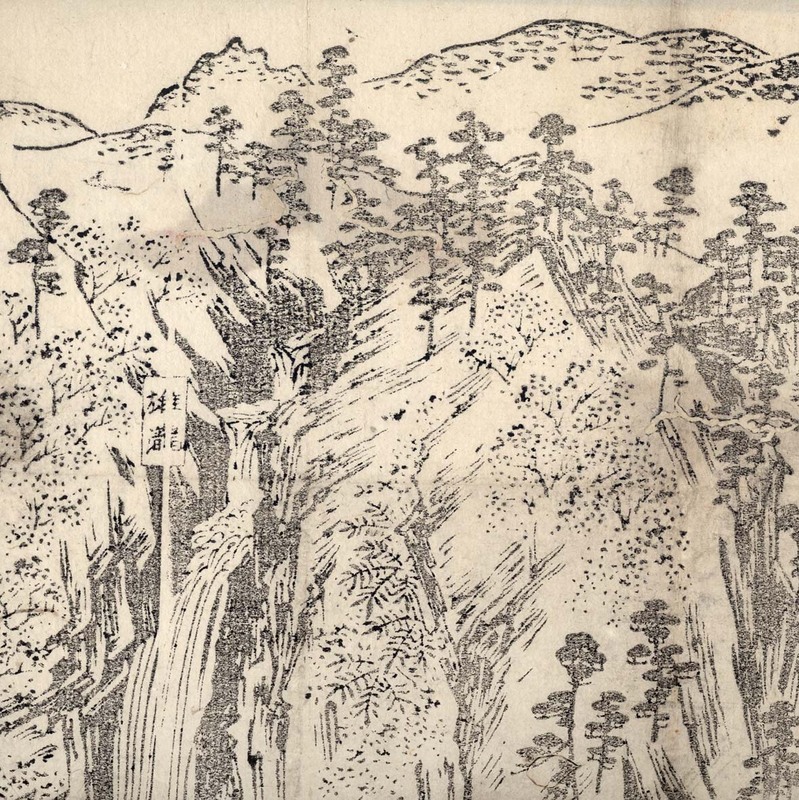 If my idea is correct, my friend also mentioned that the cartouche near the top of the waterfall signifies “male dragon”. For me this relationship between turtle and dragon fits perfectly with the legend of the fisherman, Urashima, who set up home in the Dragon Kingdom but becomes homesick for the seaside. On leaving to return to the sea, Urashima was given a chest but is told by the Dragon folk not to open it on his trip. When he arrives at his seaside hometown he is amazed to find that everything has changed and centuries have passed. In a fit of depression and with Pandora’s curiosity he opens the chest only to be turned into a two-centuries-old man. 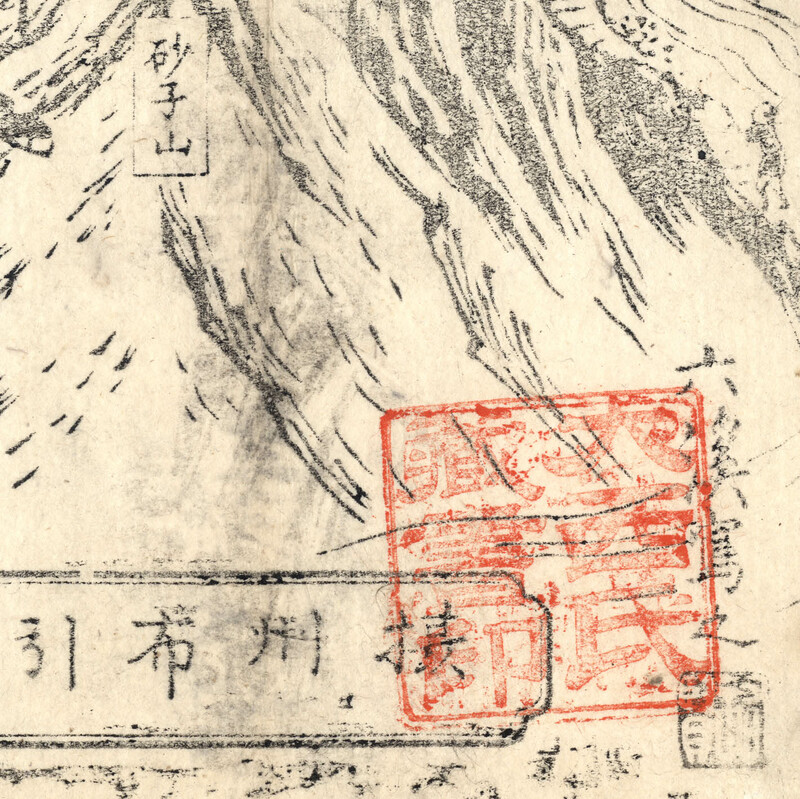 Regarding the artist responsible for this early woodblock map, 六溪写之,I am advised that it is executed by the artist “Roku Kei Utsushi No” (literal transl. 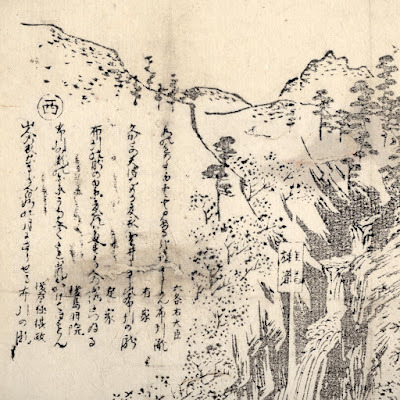 “Six streams written”). Sadly, I can find no reference to this artist.